KAY Studios makes it easier for your company to make corporate commercials. 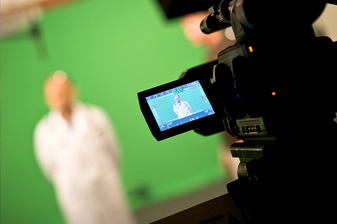 KAY Studios makes it easier for your company to make corporate commercials. Our East Providence location features a 40’x40’x18’ two-wall, hard cyclorama that acts as a perfect backdrop for many different needs. We can also assist with a variety of other services, such as set construction, talent casting, or equipment rentals, to help you make the best commercial possible and make it easy on you and your company in the process. Whether you are small company looking to make a commercial or a large corporation that needs the space, our facility and range of services will fit your specific requirements. Every corporate commercial has specific, and often unique needs. From set design and construction to lighting and equipment and more, KAY studios can help meet your corporate commercial's unique requirements and keep your production on budget. Contact us and let us know more about your company and what your needs are. We look forward to showing you how KAY Studios can help make it easier for you to produce corporate commercials!